This cathedral- and university city of Trier on the Mosel was founded more than 2000 years ago, and is Germany's oldest city. Its documented history (at least the documented bit) dates back to the Latène Age (475-20 B.C.). The inhabitants of this region at that time were the Celtic tribe of the Treverians, which were defeated and "romanised" by Julius Caesar in the Gallic Wars (58 -51 B.C.). In the Trier valley of the Mosel was a small Celtic settlement, as several interregional trade paths crossed over here. 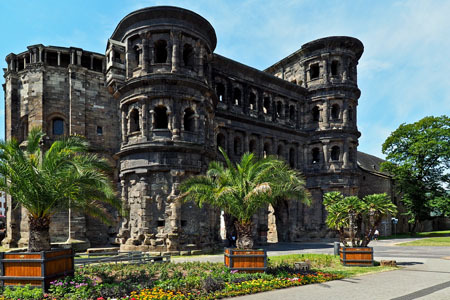 The foundation of Trier as Roman city ("Augusta Treverorum" —Imperial city of the Treverians) happened between 16th and 13th B.C. following an administrative act by Emperor Augustus. Subsequently the "new" Trier grew quickly, and by the middle of the 1st century A.D. it was already a rich and powerful city. Under Diocletian (284-305 A.D.) Trier became the administrative centre of one of the four Roman prefectures, and next to Rome, Alexandria and Byzantium was one of the most influential cities in the Roman Empire. From 286 until 381 A.D., Trier was promoted to the imperial residence and administrative centre of the western half of the Roman Empire. With 70,000 inhabitants Trier was by far the biggest city north of the Alps. Impressive sights still bear witness today to this magnificent era: (1) the Porta Nigra, the "Black Gate" from 180 A.D., which is the most admirable Roman construction north of the Alps, having survived 1800 years of eventful history in an almost impeccable state; (2) the Konstantinsbasilika — a late Antique brick structure, which was built on former Roman foundations at the beginning of the 4th century A.D. by Konstantin I as the throne room ("Aula Palatina") in his imperial palace (since 1844 the church of the Protestant community in Trier); (3) the Amphitheatre from the 1st century A.D., with a capacity of more than 20000 visitors approaching that of Rome's amphitheatre; (4) the Kaiserthermen, which Konstantin I started, and is well-preserved above-ground, though with an ingenious underground system of water channels and heating pits; (5) the Barbarathermen from the 2nd century A.D., as well as (6) the Römerbrücke, which still has five pillars on its Roman foundation. Around 475 A.D. Franconian troops conquered the city, and Trier became part of the newly developed Merovingian Empire. With this a long history of prosperity ended for the city. Only its expansion as a bishop's seat, and with the building of the Trier Electorate could the city reconnect with its former glory. In the Middle Ages Trier was the capital of an extensive church province, and the main seat of an electorate. The most famous representative of this electorate was Balduin of Luxemburg (1307 - 1354). The worldy power of the Trier archbishops only ended in 1794 with the French occupation. The early Romanesque cathedral is more than 1600 years old, making it the oldest cathedral in Germany. Together with the Liebfrauen Church and the Roman historical monuments, it is classified as a part of the world cultural heritage and is under the protection of UNESCO. The most noticeable building at the Trier market is the "Steipe", a four-storey building with pointed arch arcades that open towards the market. The "Steipe" was built in 1430, and 50 years later completed in its current form. The market court was held under the arcades. As a festival building the Steipe has a truly representative character, reflecting the self-esteem of a prospering bourgeoisie in the 15th century. In fact, at that time the medieval feudal system was in a deep crisis. The transition from natural produce - to monetary economy happened in all areas and with increasing speed, and thereby questioned the old dependency structures. The cities with their newly won economical power and urban culture demanded a change of society, classes and status. An expression of this was the fight over the "district freedom" of the cities, aiming to maintain and strengthen civil freedom. At the same time the state authority was replaced by territorial states. Characteristic for this time of change and the associated spirit of optimism is the writing of universal scholar and philosopher Nikolaus von Kues (1401-1464), who was born in Bernkastel-Kues a few kilometres downstream on the Mosel. His theoretical writings meant the end of medieval thinking. Today, Trier is a regional centre in the corner where France, Luxembourg and Germany meet. The university, founded in 1970, has done its part to make Trier not only a centre for tourism but also a place of scientific renown as well.